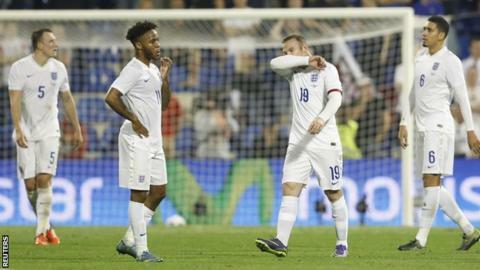 England suffered their first defeat in 16 games as they were beaten by European champions Spain. Manchester United midfielder Michael Carrick had a night to forget, as did a few more of Roy Hodgson's side. So how did England's players fare overall? Chief football writer Phil McNulty runs the rule over the players on duty. England's captain for the night was a reassuring presence, commanding his area and he could do nothing about either goal. No major errors in defence but not really able to influence affairs further forward with his pace. Still very much Nathaniel Clyne's understudy. Not international class. Good night for Bertrand and was one of England's few attacking threats in the first half with a couple of surging runs and good crosses. Did his case no harm. Battled gamely against Diego Costa, who was eventually substituted, but still carries an air of panic and surely not a Euro 2016 starter. Improving all the time and looked the part again here. Slowly but surely stepping up his claims to start in central defence in France next summer. Utterly anonymous and posed further questions about his ability to influence games at this level. So important for Manchester United but his England career has been a missed opportunity and was carried off on a stretcher late on. Busy night for a player who has been sidelined with hamstring injuries since his move to Manchester City. Industrious but largely ineffective. Undistinguished night for the Liverpool midfield man. Gave the ball away too often and occasionally lightweight in the physical exchanges. Not as impressive as against Estonia and Lithuania as this was a real step up in class - but showed some first-half flashes that hint at his genuine quality. Fed off scraps all night but never stopped working and almost got on target with a rasping shot just wide. Kane is a real contender to start up front for England at the Euros. Came on as Spain exerted their dominance so little opportunity to impress. Same applies to Dier as it does to his Spurs team-mate Alli - almost an easing-in debut and time for judgement will be in the future. Thrown on with the game going away from England. Peripheral . Not on the pitch long enough to warrant a rating.